“Allies of the world unite!” says Jim as he hurls his bass into the sky. Hi! So we’ve got some tasty new gigs coming up. 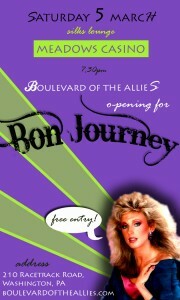 THIS SATURDAY we are opening for Bon Journey (Bon Jovi / Journey cover band!!) at Silks Lounge, Meadows Casino on Saturday 5th March (“wiiicked” is what I think of that). Click the image to read the deets. Also… I just wrote a new song. Click below to check it out. It’s called ‘Sweet Olive’. Amy happens to think it should be ‘Sweet Amy’. Well she would, wouldn’t she? !